The formation of a new state company called "Bioenergy Ireland" has been included in the programme for government. On balance, this is a good idea, with the caveat that citizen’s interests be the top priority in shaping this new entity. A part of the Fine Gael NewERA plans, the idea is to merge Bord na Mona and Coillte into a new State company to drive development of the bioenergy sector. Not much of the detail has been planned as yet. Fergus O’Dowd has been appointed Junior Minister in charge of delivering the project. 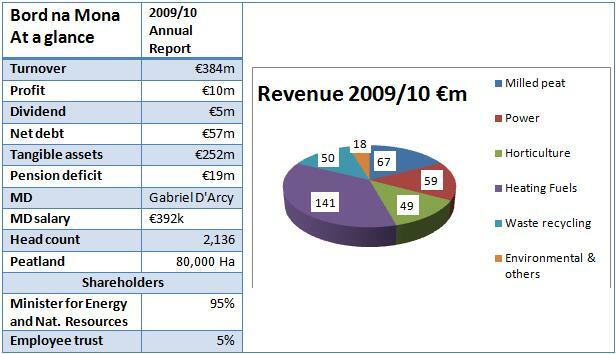 ﻿﻿﻿﻿﻿﻿﻿﻿In the plan €900m is earmarked for this company over a 4-year period. A doubling of the current afforestation programme would be the biggest investment undertaken by this company, but also research into advanced transport biofuels and heat and power generation is planned, as well as the development of district heating and new biomass supply technologies. Bord na Mona manage large tracts of Ireland’s peatlands. It has evolved into a diverse group, but derives most of its revenue from extraction of peat for energy or horticultural markets. It is undergoing a transformation with a stated aim to be peat-free by 2025. Coillte manages the state’s forestry assets - 7% of Ireland’s land area. A merged entity would create a business with €600m of revenues, fixed assets of €1.6billion and a workforce of 3,000. There would be cost-efficiencies through reduction in overheads. This would take a few years after a merger to bear fruit. Both companies have been in acquisition mode over the last decade. Coillte has added a substantial panel board side to their business. Bord na Mona entered the power generation sector through acquisition and has added on recycling and other businesses. The union would bring together key parts of the bioenergy sector – the forestry supply chain (Coillte) and a range of energy customers from power plant operators to home-owners (Bord na Mona). There are clear overlaps in the business strategies of each group. For example, both now offer bioenergy supply contracts to commercial customers. In wind energy, each has a number of sites under development, and has sized up investments in the same businesses. 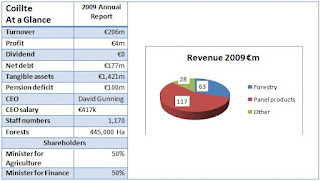 An example was the renewable energy group SWS, eventually sold to another state body involved in the auction – Bord Gais. There is not much sense in state companies competing to acquire private companies. Bringing these groups together would hopefully lead to some joined-up thinking in government about how their resources are best deployed to put citizens back to work. 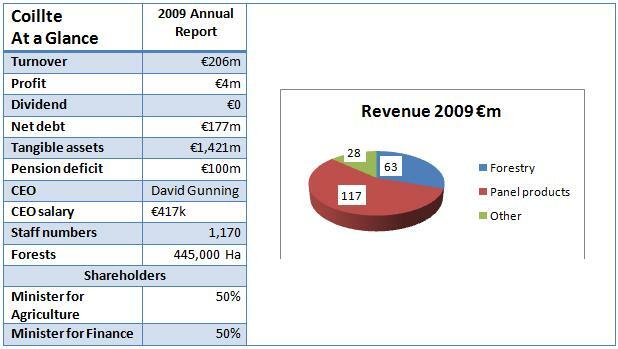 Coillte control’s about half of Ireland’s forestry. Will the planned new afforestation invest only in public forestry? Private forests play a big part in developing and supporting local jobs and must not be squeezed out of the energy supply chain. The entry of a large state-backed Bioenergy business must not prejudice the interests of private SME’s. Up to €900m is to be invested in the new business over four years. Some of this can be paid for through diversion of existing planned investments, such as the afforestation budget. Bord na Mona already has a research and development programme underway. Both companies have been successful in raising private finance and will continue with this. Raising capital should be more straight-forward for a larger merged entity. Displacement of current public energy spending commitments (on imported fossil fuel) can be used to support renewable energy investment. Public buildings spend about €300m a year on fossil fuels for heating. It would be hugely beneficial to pump this money back into the local economy. On a practical level, Coillte has a €100m shortfall on its pension obligations, a hurdle that will have to be negotiated as part of any merger. Afforestation investment has a very long time horizon. The first harvest from a forest plantation comes about 20 years into its life. We have more pressing renewable energy targets to hit by 2020 which will not be delivered through additional forest planting. Bord na Mona has an even shorter horizon, requiring about 300,000 t of biomass by 2015, and to that end are now offering 20 year contracts to farmers to grow biomass energy crops. There is a debate currently on privatisation of state assets. A merger would take privatisation off the agenda for now. There are activities within either group that would be non-strategic to a new bioenergy company and could be sold. Bord na Mona has been a central part of the midlands economy for 75 years. Maintaining and increasing employment in the region must be a priority for the new entity. Stakeholders in popular tourist and leisure regions will campaign to ensure no adverse impact on amenity and recreational facilities maintained by either Coillte or Bord na Mona. It’s too early to draw definitive conclusions on the merits of the merger with an absence of concrete information. There is a great opportunity to stimulate the bioenergy sector through public investment. It is a good idea, provided it is managed in a careful way and with Irish citizen’s interests at heart. It will be a difficult marriage to broker. A whole range of local and national considerations will influence the outcome. There was a rather disturbing report on prime time last night (3rd March) about farmers being evicted from their land to make way for palm-oil and sugar cane plantations. You can rewatch it here Minutes 25 to 35. The issues presented in the Primetime feature only serve to highlight how it is necessary to ensure the production and use of biofuels in a fully sustainable manner. The Round Table on Sustainable Palm Oil (RSPO – http://www.rspo.org/) is a global organisation whose objective is to promote the use of sustainable palm oil through the development of credible schemes & standards and engagement with stakeholders. Clearly, the palm oil sector in Honduras is not operating to any such like scheme. All biofuel in Ireland must comply with strict EU sustainability criteria for biofuels. In Ireland there is a Biofuel Obligations Scheme (BOS) in place since 2010, legislating that 4% of all road fuels are biofuel. The majority of this biofuel is imported as a pre-blended mix from oil refineries – a situation which has resulted in Irish biofuel producers being effectively excluded from the market. IrBEA is calling on the incoming government to revisit its policy in relation to biofuels to ensure that producers of sustainable Irish biofuels can access this market in a fair and equitable manner. This will give a much needed boost to this potential growth sector of the economy.